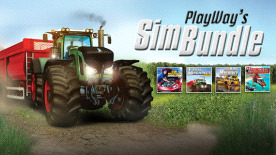 Farm Machines Championships 2014 The ultimate farmers’ showdown is back, better than ever with brand new machines, fast paced competitive events, and new landscapes and terrain. Car Mechanic Simulator Complete Edition Now you can own and operate your own auto repair service with PlayWay’s Car Mechanic Simulator 2014. Helicopter Simulator 2014: Search and Rescue Become an emergency pilot and test your skills to their limits, as you sit in the cockpit of an emergency helicopter, across more than 40 challenging missions. Choose from 8 models of 'copter, each varying in size, ability and specs. Construction Machines 2014 Become a boss of a construction company. Demolish old houses, flatten the ground, fill foundations with concrete and build new buildings - this is what you do. Sit behind the wheel of different construction machines - from trucks and diggers to huge cranes. Win contracts and gather money to expand your company and buy or upgrade your machines.